how to use discernment in deciding which practice is right for you. into your classes so your student’s leave with valuable insight and feeling transformed! Morning: Practice Vinyasa Flow and Discuss Sequence: ROOTS AND REBOUNDS, LEARNING TO LIFT OFF THE GROUND. Learn tips and tricks to open your wings and get your body off the ground. Face this exploration of arm balances including handstands with courage, breath, and playfulness. No need to fight your way up, learn a pathway to channel these postures into your practice with enthusiasm and ease. self exists. Through yoga, one can begin to access these bodies transporting the self to liberation. manage our energy and improve the way we respond to life. difficulties for beginners and look to create a safe yet challenging sequence for them. At the same time, we’ll explore the art of teaching a multi-level class so you’re well equipped to support all levels in one room. different techniques for pranayama and meditation. Morning: The king &queen – headstand & shoulderstand class. Inversions are an important part of our practice creating profound shifts with in our nervous system and brain preparing us for meditation. Headstand and shoulder stand are referred to as the king and queen of all yoga asana. Headstand is referred to as the king of all poses developing masculine qualities of will power, steadiness and clarity of the brain, while shoulder stand develops the feminine qualities of patience and emotional stability. When performed together these opposite effects create a strong sense of balance preparing you to move into the higher limbs Yoga – Pranayama & Meditation. We will break the important parts down of learning to hold headstand and shoulder stand and adding variations. Ayurveda is the sister science of yoga, teaching us how to live our lives in harmony with nature. We teach yoga and Ayurveda together to enhance the benefits of our practice, ultimately leading to longevity. As yogis, we learn that everything is energy and that the food we eat will affect our well-being and how we react to the world and those around us. Understand how to integrate this sister science into your daily routine to bring more harmony and balance into your life. Joan Hyman’s grounded teaching style seamlessly supports her students as they emerge from their practice with the rich and bright energy that yoga has to offer. It is here that the space is created for her students to deepen their personal journey while aligning with the teachings of true yogic traditions. 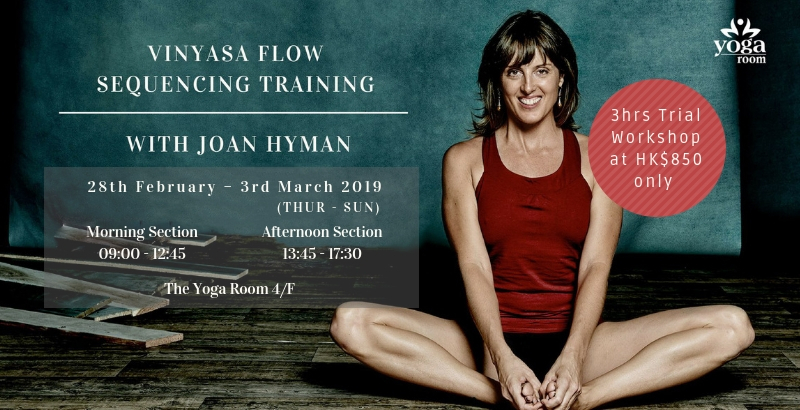 Joan’s teachings come from an organic and intuitive place, as she draws upon the combination Ayurveda, meditation, as well as the studies of Ashtanga and Iyengar yoga. An authentic modern day yogi, Joan’s love and devotion show up in her practice and through her teachings.